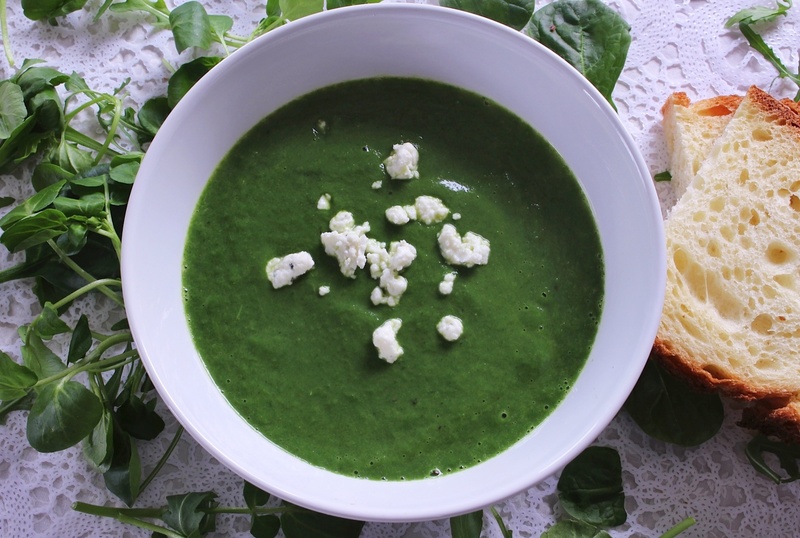 Super green soup | dash.drizzle.dollop.devour. A simple, vibrant soup. Pure green, green, green – the colour alone is just so beautiful. And the flavour is peppery and bright, refreshing and nourishing. It’s like a turbo-watercress soup, unadulterated by cream or potatoes; just fresh, clean, intense flavour. I’ve been making this soup for years; it’s one of my favourite products of some kitchen dabbling, in this case finding a use for a spare bag of spinach, rocket and watercress salad on a not-in-the-mood-for-salad day. It’s fairly light too, definitely one to bear in mind when you feel a bit overindulged or in need of a few extra vitamins. You need a fairly large pan for this, so that you can fit in all the leaves at the end. Slice half an onion and 2 large or 3 medium courgettes into about 1/2cm rounds. Put them in the bottom of your pan and just about cover them in vegetable stock, ideally allowing a few bits of courgette to just poke out of the top of the stock. Courgettes are such a watery vegetable that any more stock would result in a very thin soup. If in doubt, err on the side of caution, you can always add more at the end. Bring to a simmer and cook for 10 minutes or so, until the courgettes are very tender. Then add a large bag of spinach, watercress and rocket salad, about 200g. Let this wilt for 2-3 minutes, not too long, just enough time for the leaves to collapse. Put the whole lot into a blender and blitz for a minute until very smooth. Whilst it’s blending drop in a knob of butter. The butter just transforms the whole soup, both in texture and in flavour, so don’t be tempted to skip it. Add plenty of pepper and salt to taste. Makes two generous bowlfuls. Sometimes I eat them both. Shopping list: 2 medium or 3 large courgettes, 1/2 onion, 200g spinach, watercress and rocket salad leaves, about 300ml vegetable stock, butter.